We’ve waited for a year. And now it is here. Nine artfully crafted tracks that would make the late John Lennon smile. 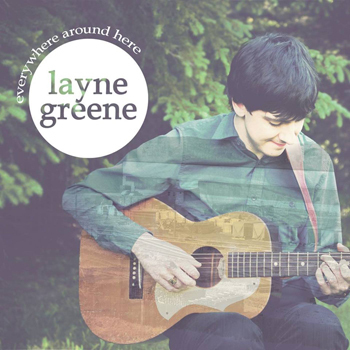 Layne Greene continues to prove that he is a clever song crafter. Read about the release of Everywhere Around Here in my Expats Post. Greene will be releasing the album in various formats including limited vinyl edition. This is it! My first album comes out today. I’d like to thank everyone who has had a hand in helping make this happen, it’s been over a year and a half since I started finalizing the songs and working on the plans for release, and I would not have been able to do it without everyone’s help. Throughout this process there’s been a lot of twists and turns, steps forward and steps backwards, good days, bad days, long nights, and 4 hour drives across Nova Scotia in the middle of the night through a snowstorm. All in all, I’ve learned a lot. About myself, about the industry, about how much time, effort, blood, sweat, and tears it takes to get an album finished. When we started rehearsing a year ago, I don’t think I fully understood what I was getting myself into, and I don’t think that even if I had, I would have been able to prepare any more for it. I’ve been dreaming of this day for about 7 years now, and even a year ago it was only just starting to look like a remote possibility. Luckily with some hard work and support from my team we were able to pull it all together, and today is the day! I’m excited to share the album with all of you, and I can’t wait to see everyone’s smiling faces at the rest of the shows we have lined up. Thanks so much everyone for your support, I couldn’t have done it without you!! Sounds very Simon and Garfunkel. I like the production: it’s very warm.